These wounds and their characteristics have already been discussed in detail in Chapter 4. However, a number of additional points can be made. Small clumps of unburned powder may pile up on the edges of the entrance and in the seared zone of skin found in such wounds. These collections of powder are most prominent in wounds inflicted by .22 Magnum handguns whose cartridges contain ball powder. Near-contact wounds with handguns usually occur at ranges less than 10 mm. There is some variation depending on caliber, ammunition, and barrel length. Many textbooks, in their descriptions of contact and near-contact wounds in hairy regions, put great stress on the presence of burned hair. In actual practice, charred or seared hair is rarely seen, most probably because the gas emerging from the barrel blows it away. Even in seared zones of skin, however, unburned hairs are numerous. Occasionally, seared hair is seen when a revolver is discharged close to the head while long hair overlays the cylinder gap. The gas produced by combustion of the propellant can produce internal injuries as severe as or more severe than injuries produced by the bullet. Gas-produced injuries are most severe in the head because of the closed and unyielding nature of the skull. The skull, unlike the chest or abdominal cavity, cannot expand to relieve the pressure of the entering gases. 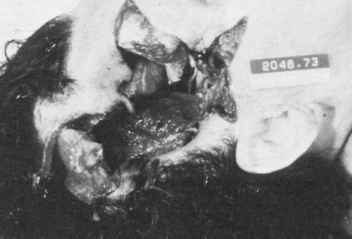 In contact wounds of the head from high-velocity rifles or shotguns, large quantities of gas entering the skull produce massive blow-out fractures with extensive mutilating injuries. The top of the head is often literally blown off with partial or complete evisceration of the brain. Contact wounds of the head with handguns, while often producing secondary skull fractures, do not ordinarily produce the massive injuries seen in high-velocity rifles and shotguns. Massive injuries from contact handgun wounds of the head, when they do occur, are associated with Magnum calibers, e.g., the .357 Magnum, the .44 Magnum or high velocity, high-energy cartridge loadings of medium caliber weapons, e.g., .38 Special +P+ cartridges. These cartridges can inflict contact wounds that in their severity mimic wounds from rifles and shotguns. Such a wound is illustrated in Figure 5.12, where the deceased was an elderly white female who shot herself in the head with a .38 Special revolver. The ammunition used was Remington 125-gr., jacketed, hollow-point, loaded with ball powder. Because of the severe nature of the wound, on the initial viewing of this body it was suspected that the woman had been shot with a shotgun. Contact wounds of the abdomen and chest from handguns ordinarily do not produce striking injuries of the internal viscera due to gas. Exceptions occur with the high-velocity +P+ loadings and the .44 Magnum, especially if the wound is inflicted over the heart or the liver. 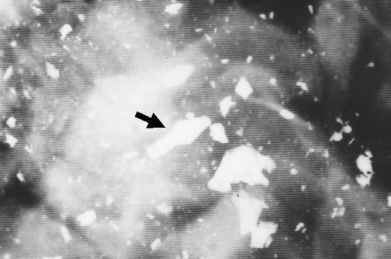 Figure 5.12 Contact wound of right temple from .38 Special revolver firing a high-pressure load.